Is there anything like a 'recipe generator' for LEGO models? For me, most of the fun of LEGO toys, is building new things from the instructions. Rebuilding things can be fun, but if I know I have certain bricks (or even sets), is there somewhere to cross-reference these with the content of other constructions/sets (official or otherwise)? Yes there is! Rebrickable.com is dedicated entirely to doing so. You can save time and import your LEGO collection from Brickset.com (If you have an account). The site will then search for other sets and MOCs you can build from the bricks you have in your collection. 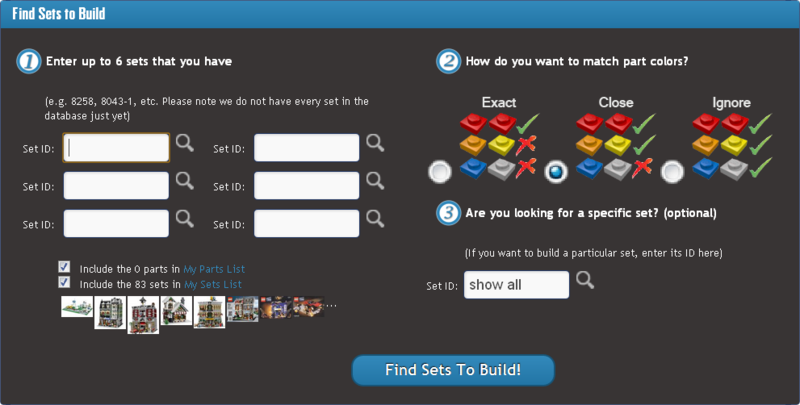 You can also even enter a list of your own parts on Peeron and have it check it against existing sets, thus letting you know what you can build, or what you need to buy to build the set you want. Not the answer you're looking for? Browse other questions tagged instructions software set-database or ask your own question. Is there a cross-reference guide? Is there any application to keep an inventory of owned sets and pieces? How can I catalog my LEGO pieces? Which BIONICLE combiner sets do official instructions exist for creating? Can you build accurate models using 100% LEGO elements by following Megablocks instructions? How can I convert an image's pixels to actual LEGO colors? How to Decipher Lego Building Instructions Filenames? How can I make Custom Instructions for my MOC? Which Lego Technic sets are officially combinable?